Last-Minute Shopping | 2P START! This comic was all Ray’s idea, and I love it. We started to get carried away with expanding the idea in different directions and the alternates were all funny, but Ray brought us back on track noting that the original idea was just as funny, so we went simple. I think Ray’s motto should be “K.I.S.S. – Keep It Simple, Stupid”. Anyway, I hope everyone still trying to get their hands on a Wii this Christmas is successful. It’s hard to believe that one year later it’s still this hard to find one! 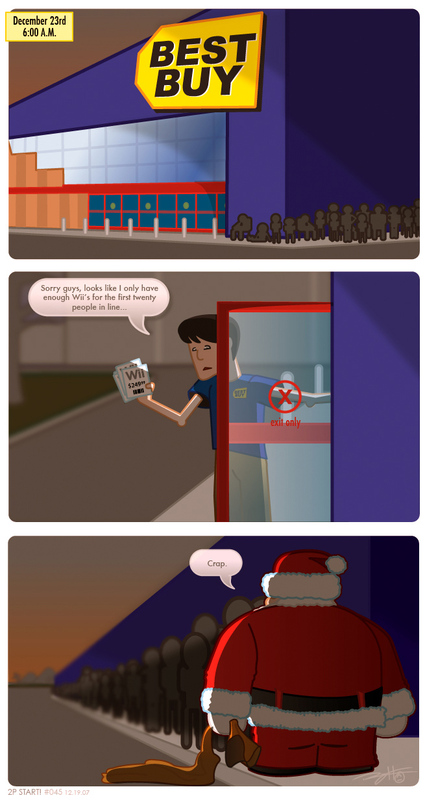 Hope you enjoy the comic and have a great Christmas! It’s nice to see that GameStop Employee finally got that big promotion to working at Best Buy. I wish everyone a very merry Christmas and happy holidays. It is hard to believe that even after a year, Wii is still selling out everywhere. It is a great system. FRIKKIN AWESOME GUYS!!!! This one’s great, and just makes me appreciate even more that I worked at gamestop on 11/17/2006 😀 . Almost lol’d at work too. I found this comic like 2-3 weeks ago, I am a long time reader of CAD and Penny Arcade, and I really enjoy this one also. I am stationed over seas and when I went to California on leave, one awesome morning we went to Target to do some random shopping and boom I saw them, two Wiiis! I had been waiting for some to come to our Base Exchange but we only got 10 back when it first got released. I bought one that morning and left the other one there to give some other poor sap a chance in hell to buy one too, but as I bought the first one I saw an employee liberating the second one to the back of the store. I was a bit pissed but hey what are you going to do? And that was back in August! Man, It’s just amazing to see that it got to the point that people are in line to pay full price just for a plastic case that says “You won’t get a Wii this year, but you’re better then the ones that won’t get it this decade”. Great holiday comic guys. Merry Christmas to you and everybody here. I’ve been reading this comic since it started, can’t remember when that was or even how I came across the comic, but I suppose it’s about time I left a comment showing my appreciation. I really love the style and humour, this is the only video game comic that I check back to regularly. I hope you all have a nice Christmas and keep up the great comics in the new year! HO HO HOooo!!! I mean… HA HA HAaaa!!! Plain and simple, awesome. Ray got it right here. Priceless… great… awesome… what other words can I say? It was spot on. Also, sometimes it is nice to be an early adopter and be willing to freeze for 24 hours… just for a simple white box of joy. Heh. Love it guys. I think they need to be archived. Your behind on that. The drawing in the last panel made this comic. Lookie what I found!!!!!! -><- I think the Vii deserves the record for shortest console life-span EVAAARRRRR!!!!!! !